The Pioneer Inshore Surface Mooring is located on the inner Continental Shelf, approximately 90 meters deep. The Continental Shelf-Slope area off the New England coast is a highly productive area and one that is located at a dynamic intersection where ocean currents meet in weather-like “fronts,” and where nutrients, pollutants, and other properties are exchanged between the coast and the deep ocean. Data from the inshore, shelf area help to examine exchanges between the shelf and slope and the shelf ecosystem, as well as provide broader insight into the issues of air-sea gas exchange, including Carbon Dioxide. Like other Coastal Surface Moorings, the Pioneer Inshore Surface Mooring is specifically designed to examine coastal-scale phenomena and withstand the challenging conditions of shallow coastal environments, including large tidal fluctuations. The Surface Mooring contains instruments attached to a Surface Buoy floating on the sea surface, Near Surface Instrument Frame 7 meters below the surface, and a Seafloor Multi-Function Node (MFN) located on the seafloor. 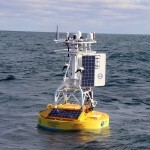 The Surface Buoy provides a platform on which to secure surface instruments above the sea surface, below the sea surface, and across the interface between. Additionally the Surface Buoy contains an antenna to transmit data to shore via satellite.